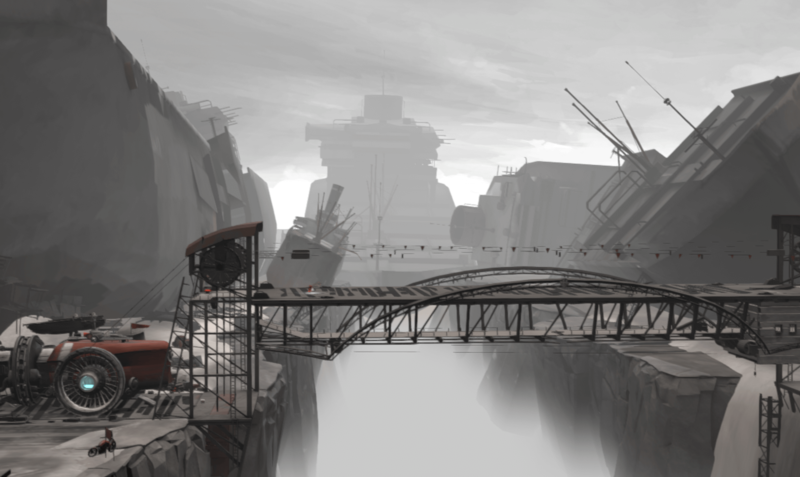 At first, FAR: Lone Sails doesn’t give you much to work with. The player is immediately given control of a small person clad in red and introduced to a rickety old house. The first and only explicit instruction the game provides is a key prompt that enables the protagonist to pick up and put down objects in the environment. You get to figure out the rest on your own. The gameplay mechanics are simple enough that a trial-and-error method of learning feels more liberating than frustrating. Essentially, you navigate the world in a large machine that runs on a combination of environmental debris and input from the protagonist. 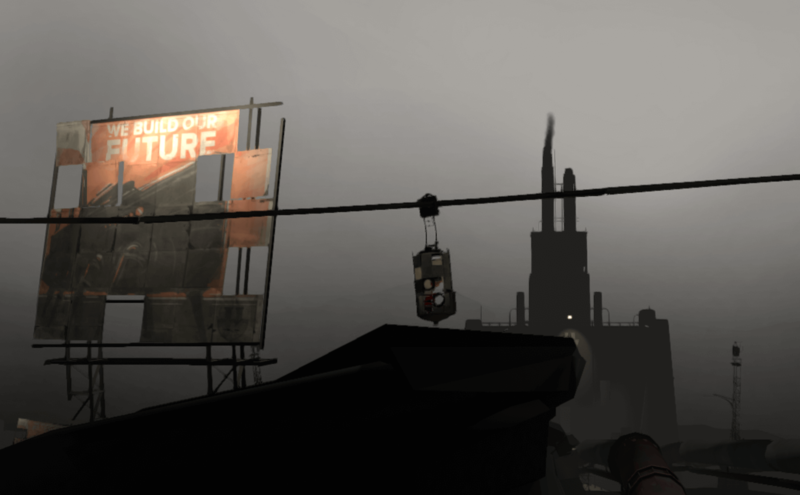 It quickly becomes clear, upon entering the protagonist’s vehicle, that the primary objective of the game is to move forward, to travel beyond the modest home to which the player is first introduced, and to see what the post-apocalyptic landscape has to offer. If you encounter certain obstacles, the game will occasionally point you in the right direction — when a device catches fire, a light will blink above the hose; when something is attached to the vehicle’s winch, a light appears above the button used to reel it in. Still, the game mostly leaves you to your own devices. As you venture further into the world, you encounter various resources and obstacles. Sometimes you come across fuel, flashlights, a radio or even explosives. Similarly, along the way, you can locate and equip new gear for your ride — including but not limited to new wheels and black sails. The vehicle under the protagonist’s control often literally runs into barriers, be they steel gates or closed drawbridges. The workarounds for these obstacles are varied — sometimes the solution is to platform your way over to a switch that opens the gate, and other times the solution is just to ram the vehicle into the barrier until it gives way. Sometimes figuring out these fixes is satisfying; other times, it seems like a needless interruption in your journey. Perhaps unsurprisingly, FAR: Lone Sails’ greatest strength is not its mechanics but its world-building. As you drive the large, rusty vehicle throughout a sometimes desolate landscape, you come to recognize markers of a formerly thriving civilization that have fallen into ruin. The art, while simple, is strikingly beautiful in its minimalism, with shipwrecks towering above the protagonist’s path and a sky whose colors change gradually, sometimes even gently. To be sure, the game isn’t all sunsets and quiet ruins — more volatile markers of the world’s conditions confront the player as well. On several occasions, raging storms descend upon the protagonist and their trusty vehicle, ensuring that the player knows how dangerous and unpredictable the world can be. There is even a monument of sorts that memorializes not just a civilization, but an absent person. FAR: Lone Sails manages to deliver a compelling and vibrant world without any of the overwrought exposition that bogs down many post-apocalyptic narratives. This visual world-building goes hand-in-hand with a truly beautiful soundtrack. The music in the game varies from soft ambient noise to swelling orchestral arrangements to suspenseful piano pieces. Each piece sounds balanced and organic while also enhancing the experience of discovery within the game. The tracks are perfectly timed to coincide with the player’s experiences and contribute to the way that they perceive the environment, giving them a chance to feel pensive or awestruck or unsettled. A battered billboard reads “We build our future.” A little ominous, no? However, the ending, while beautiful, is rather underwhelming. Without giving away too much of the game, I can say that the ending focuses on a lovely vista, but one no more or less lovely than the many other vistas to which the player is exposed throughout the game. The conclusion could have held just as much significance and arguably more if it had led the player back to the house where they began, or if the end of the journey brought our little red-clad protagonist into contact with another living person. All pros and cons aside, I firmly believe that FAR: Lone Sails is truly a rewarding game and an even more rewarding work of art. Some player reviews have focused on the limited and sometimes repetitive nature of the game’s mechanics and platforming, but I find this criticism to be somewhat short-sighted — there is far more to this game than just its gameplay. The combination of simple yet engaging environmental puzzles, elegant artwork and a masterful soundtrack make for a deeply impactful experience. Truly, the greatest meaning is found in its journey, not its destination. FAR: Lone Sails is available now on PC and Mac.